Georgia Gwinnett College (GGC) is one of two access institutions within the University System of Georgia that primarily offer baccalaureate degrees. The GGC mission states that the College “provides access to targeted baccalaureate and associate level degrees that meet the economic development needs of the growing and diverse population of the northeast Atlanta metropolitan region.” Founded in 2005, Georgia Gwinnett College (GGC) operates, and has always operated, in the context of a clear strategic plan derived from its mission. From its inception, access to and success in baccalaureate education have been at the center of the College’s efforts. GGC’s growth and its success in serving a challenging population are evidence of the College’s commitment to providing not only access to post-secondary educational opportunity but also support structures that engender success. GGC’s game-changing model of education reflects our values of access, attention, and affordability. We use a coordinated care model of learning and progression, integrating efforts across campus to ensure that we best serve our students. Further, we provide intersectional programming for student success, understanding that layering high impact practices both addresses the widest audience and has the greatest effect on students reaching their academic and personal goals. Our efforts in coordinating care and providing intersecting student success programs coincide with our attentive teaching and learning model, in which active and authentic learning experiences focus instructional design, academic programming, and faculty development activities. For these reasons, we discuss below our strategies and activities in clusters that work in tandem towards promoting the values at the heart of GGC’s mission: coordinated care; intersectional student success programming; and attentive teaching and learning. These strategies are not interventions added to our core institutional makeup but together form the basis of our institutional culture, where innovations and initiatives in teaching, advising, and mentorship affirm our commitment to supporting the success of every student. A review of the basic demographic characteristics of the GGC student population shows a preponderance of those who are traditionally underserved and for whom substantial support structures are essential. GGC students tend to have relatively low levels of academic preparation. The mean high school GPA of GGC’s Fall 2015 entering freshman cohort was 2.79, among the lowest in the USG State Colleges. Each cohort of first-time entering students at GGC has had a consistent academic profile with a mean high school GPA of between 2.69 and 2.82, with over 25% requiring remediation in at least one core subject (Math or English). New transfer student cohorts have traditionally entered with a mean transfer GPA between 2.3 and 2.9 and transfer in an average of 40-45 semester hours. GGC enrolls a substantial number of first-generation college students. Results from four consecutive years of the Beginning College Survey of Student Engagement (BCSSE) indicate that 40-50% of the entering first-time students are from families in which neither parent has a college degree. A more detailed analysis of the most recent entering class shows that 38.6% of entering students have no parent with a college degree. Other self-report data continues to indicate that over 20% of entering GGC students are the first in their families to attend college. These findings suggest a substantial portion of the student population may enroll without having had a model of college attendance as a regular part of their formative educational experience. GGC is a majority-minority institution. GGC enrolls a highly diverse student population and has been majority-minority since 2009. GGC has been recognized by US News and World Report as the most diverse college in the South. For Fall 2015, the College’s race/ethnicity data show that its student population is 35.6% White, 32.6% Black/Non-Hispanic, 16.9% Hispanic, and 10.1% Asian. This pattern of racial/ethnic enrollment has been consistent for several years. GGC enrolls a high percentage of Pell Grant eligible students. For the past four years, over 50% of each entering freshman cohort has been eligible for Pell grants, and over two-thirds have received financial aid of one form or another. For the upcoming academic year, preliminary data show that over 60% of GGC students are Pell eligible. GGC students are primarily traditional-aged and full-time. For each of the past four years, 98% of GGC’s incoming freshmen have been under 24 and 84% of the student population as a whole is of traditional age (18-24). Further, 68% of the student population is enrolled full-time, taking 12 or more credit hours per semester. However, GGC students are more likely to work over 20 hours per week than most traditional-aged, full-time students. The 2014 NSSE data show that 35% of GGC’s first-year students and 47% of prospective graduates work over 20 hours per week in comparison to national results of 12% and 34%, respectively. Similar results were found in the 2013 NSSE data. These consistent characteristics of GGC’s student population, along with the mission’s concentration on providing both opportunity and support, have shaped the College’s specific strategies for promoting completion. GGC’s key priorities in support of Georgia’s college completion goals are focused on increasing enrollment among typically underserved populations, aiding students with a successful transition to higher education, and providing tools that enable early successes for our students. GGC has focused first on increasing access and success for the traditionally underserved. An effective transition to higher education is facilitated by the College’s focus on student engagement and student success in the first year, most notably through advising programs, faculty mentoring and block scheduling. Early successes are fostered by the provision of tools such as academic advising for students enrolled in Learning Support pre-college courses, concurrent remediation, the multi-faceted tutoring program available to all students through the Academic Enhancement Center, and programs tailored to the needs of specific sub-populations of first-year students. The College’s overall commitment to active learning and authentic experiences for all students nurtures ongoing success, deep learning, and preparation for post-graduate careers and study. Finally, GGC’s commitment to maintaining an affordable environment makes continuation and completion more possible for our student population. Primary Points of Contact: Dr. Melinda Spencer, Sr. Associate Provost for Operations; Dr. Justin Jernigan, Dean, School of Transitional Studies. GGC opens the door to four-year degrees for many people, including those who might have never considered college. As the student body profile above indicates, GGC has sought, recruited, and enrolled a highly diverse population that draws strongly from traditionally underrepresented groups. These results arise from the efforts of both Enrollment Management, through their recruitment, admissions, and financial aid efforts, and the School of Transitional Studies, which is responsible for programs and services to bring students into the college and support their academic and personal transitions while enrolled. GGC has focused intentionally on creating deep and meaningful relationships with the Gwinnett County Public Schools, recognizing our mission to serve our immediate geographic region and the size and scope of the population in Gwinnett County. Similar sustained attention is dedicated to other schools from which GGC attracts students. These relationships are developed and sustained through ongoing events and visits. GGC’s Admissions Counselors have built working relationships with guidance counselors at 202 individual schools in Georgia and are committed to visiting each school 2 -3 times a year. Over the 2015-16 academic year, admissions counselors made between 400 and 600 individual high school visits. GGC’s Open House event welcomed approximately 700 guests for the Spring (March 19) 2016 event, with nearly 400 estimated to have been likely students for the Summer or Fall 2016 semesters. The English Language Institute (ELI) at GGC in Fall 2016 satisfied the English language training needs of 23 non-native speakers of English, several of whom indicated plans for enrollment as GGC students in upcoming semesters. Of these ELI participants, four were issued student visas for English as a second language study at the ELI, with the others participating in a special short-term program at the ELI. Currently, at least three former participants in past ELI short-term programs have enrolled as students at the College. GGC has committed to the Beyond Financial Aid framework recently presented by the Lumina Foundation. Following a comprehensive review of current campus knowledge and programs, GGC has identified several already ongoing efforts that fit under this umbrella. Further, the College has included consideration of what was learned from the BFA assessment in its current strategic planning processes. The existing support structures on campus are listed below, sorted into the type of support offered. The Georgia Gwinnett College Summer Academy (SA), overseen by the Office of New Student Connections within GGC’s School of Transitional Studies, allows new GGC freshmen who have tested into an English and/or Math Foundation course an opportunity to complete the course(s) prior to the Fall semester. By completing the course(s) during the Summer semester, students are able to become acclimated to GGC while meeting prerequisite course requirements for their program plans. The 2016 SA hosted 19 students, an increase from 2015’s 11 students. Demographics for the 2016 SA participants were self-described as: 14 female, 5 male; 17 African-American, 1 Hispanic, and 1 White. Eighteen of the 19 SA participants lived in Residential Life for the duration of the Academy, as one student could not due to extenuating circumstances. Lastly, 2 of the 19 students were registered with Disability Services. SA participants were enrolled in Foundation English (ENGL 0989) and/or Foundation Math (Math 0987/0989). Students who only needed one foundation course were also enrolled in Music Appreciation (MUSC 1100). Tutorial support was provided to SA students through tutor placement in the Foundation courses as well as a mandatory tutoring block. Further support was provided to SA students through a series of workshops facilitated by the GGC Mentoring and Advising Center. These workshops focused on topics such as study skills, time management, and goal setting. Counseling and Psychological Services facilitated a workshop on the topic of stress management and the services that are offered to students. The Career Development and Advising Center also facilitated a workshop, focused on the importance of student involvement and services offered by the Center. Beyond these support services, SA students participated in a minimum of two required meetings with their academic advisor and received support from the Office of New Student Connections as needed. Nine of the 10 registered students in Foundation English successfully completed the course with a grade of C or higher (A-4, B-3, C-2). All 14 students enrolled in a Foundation Math course successfully completed the course with a grade of B or higher (A-10, B-4). Thirteen of the 14 students in the Music Appreciation course successfully completed the course with a grade of C or higher (A-2, B-7, C-4). Moreover, 95% of the 2016 SA participants registered for courses for the fall 2016 semester. This level of enrollment is a positive continuation of the 2015 SA, which had 100% of its participants enroll in at least one semester of the 2015-2016 academic year. Also managed by the Office of New Student Connections within GGC’s School of Transitional Studies is the Bear Essentials new student orientation program. One means of assessing the effectiveness of Bear Essentials is through a student survey that is administered during each session. For the new fall students who attended Bear Essentials this past summer, a summary of the results follows. 77% of the respondents reported they were assigned to courses in blocks. 43% changed their block at Bear Essentials (the most common reason checked was “other”). 73% said they were able to register for the courses they needed. 77% participated in the Housing tour. 33% attended the Showcase (an opportunity to meet with advisors and representatives from Financial Aid, Housing, and other offices). The mean response to the question “do you feel better prepared to start classes after BE” was 3.68. The mean response to the question “was the Ed Tech session helpful” was 3.9. The mean response to the question about the skit being engaging was 2.6. The mean response to the question about the skit being informative was 2.8. The mean response to the question about BE being a good use of time was 3.4. Among several hypothetical scenarios presented to students on the survey, the majority of students (approx. 80% in all questions) knew where to go for assistance to resolve the issue. For several questions about appropriate behavior for alcohol use or sexual assault risk reduction, over 80% knew the correct responses. Bear Essentials programming also includes parent/family orientation meetings to enculturate families to college life and GGC in particular. In AY15-16, BE offered a bilingual parent orientation session in Spanish, and this type of offering is likely to increase to address the needs of GGC's diverse student body. All GGC faculty serve as mentors to students. Upon enrollment, students are assigned to an advisor or mentor based on their academic background and expressed interests. Upon declaration of a major, students are assigned a mentor in their major discipline. Students identified as at increased academic risk are assigned to an advisor in the Mentoring and Advising Center (MAC). The MAC is staffed by a Director, Assistant Director and 6 professional advisors, with two additional advisors added in April and May 2016, respectively (total—8). Advising efforts address the whole student and his/her needs (academic, social, and/or emotional), since successful retention, progression, and graduation are contingent upon recognizing and supporting the interconnectivity between these dimensions of students’ lives. In the 2015-16 academic year, 1686 students were assigned to the Advising Center in the Fall, with 1799 students assigned in Spring 2016. GGC faculty have regular opportunities to develop their skills as advisors and mentors. For AY15-16, there was one session on mentoring at New Faculty Orientation in August 2015, which was attended by all new faculty. Mentoring best practices were addressed in sessions of the New Faculty Academy as well. All faculty participated in a mandatory Mentoring Professional Development about the e-Core in September 2015, and there was another mentoring Professional Development Session in January 2016 facilitated by the Counseling and Psychological Services Center and GGC’s Title IX office. This latter session addressed how to handle situations when students disclose information that faculty are required to report to other offices on campus. This session was attended by approximately 200 faculty members. Finally, 50 faculty members made 144 visits to student motivation workshops offered through the CTE. Because of GGC’s high population of underserved and underprepared students, motivational training is an integral part of effective faculty mentoring. The measures of progress for the MAC and the GROW programs focus on evidence that they are effectively contributing to the well-being of the GGC student population by providing services and designing appropriate programming. Since opening in fall 2013, the Mentoring and Advising Center has served 3,980 students: 1,087 students were assigned during the 2013-2014 academic year, with the addition of 1,555 new students during the 2014-2015 academic year, and 1,538 during the 2015-2016 academic year. The Center also has had about 2,000 walk-in visits. Evidence that the MAC is meeting those progress measures can be seen in the fact that it has added four additional advisors, has increased the number of entering students served from 1071 to 2463 (those assigned to the MAC), has had advising staff present MAC initiatives at national professional meetings, and continues to develop new programs to serve GGC’s special populations. The MAC also was recognized by the USG in 2015 with a Chancellor’s Gold Level Service Excellence Award for Outstanding Team. Further progress will be assessed based on the College’s success in meeting staffing and service targets for this area. The Advising Center is expanding to provide services to the all of the following: Learning Support students, English for Academic Purposes students, conditional admits, committee admits, and provisional readmits. By 2017, this is expected to create a service population of approximately 3000 students, as the trend in Table 1 indicates. The Advising Center will be staffed then with ten professional advisors. The primary measures of progress for the GROW program pertain to its success in enrolling students and the continuing development of new program offerings and support. Since its inception, the number of students served in the GROW program has grown from 50 to 164, as shown in Table 2. * 221 students have participated in the program. Some students participated more than one semester. Data continues to show that the advising programs are meeting expectations. Since all Learning Support students were assigned to the MAC for mentoring-advising, a direct comparison of equivalent groups of students who did and did not receive advising services is not possible. Instead, a year-to-year comparison is illustrated in Table 3, with data on Learning Support students from preceding years as data points. Further evidence of success can be seen in the reduced gap in first-year GPA as shown in Table 4, and retention rates for Advising Center students, as shown in Table 5. The retention data show progress toward the long-term goal for this initiative, which is for Advising Center students to have retention rates and GPAs that are not more than 5% below those of the full first-year cohort in any given year. Data for the GROW program is equally encouraging as shown in Table 6. The data indicate the success of the MAC and GROW programs for engaging and facilitating increased levels of success among GGC’s most at-risk students. Next steps involve increasing levels of support for GROW and related efforts that assist this group of students and other groups of at-risk students at the College. Efforts in this direction (e.g., hiring of additional advisors) are already underway. The Mentoring and Advising Center staff had 1538 students assigned during the 2015-16 academic year attend 2109 advising sessions, with an additional 2000 visits from students who were not assigned advisees. These numbers are projected to grow in the year ahead in support of our first-year students and other student success (learning support) populations. GGC’s investment in tutoring services has been a feature of the college since its opening. As of the most recent academic year, tutoring services are offered in a central campus location, in classrooms, online, and at a variety of other campus venues, including the campus Residence Halls. The on-campus tutoring center is open 63 hours per week and offers support for all classes and disciplines, with limited exceptions, which are typically covered in online or specialized tutoring sessions. The tutoring center, known as the Academic Enhancement Center (AEC), employs two coordinators (one for Writing, one for Math/Science), 33 professional tutors, 12 student/peer tutors, and 10 student assistants. In addition, more than 60 faculty volunteers and a small number of community volunteers have donated time to the center each academic year. In the 2015-16 academic year, the AEC saw 3489 students. GGC offers tutoring outside of the AEC through its TIC-TAC-TOE programs. The TIC program provides Tutors In the Classroom for selected courses. During the 2015 – 2016 academic year, TICs were assigned to 4 sections of EAP (English for Academic Purposes) EAP 0080, EAP 0081, EAP 0090); 19 sections of English courses (ENGL 0989,ENGL 0099/ENGL 1101, ENGL 1101, ENGL 1102), 16 sections of MATH courses (MATH 0987, MATH 0989, MATH 0997/1001, MATH 0999/1111), and 12 sections of ITEC courses (ITEC 2140, ITEC 2150, ITEC 3150). The TAC program provides Tutors Around Campus, professional tutors who provide drop-in tutoring in a variety of well-populated locations on campus such as the library, the residence halls, and the student center. During AY15-16, 7 TAC tutors supported 65 unique students with a total of 142 visits. TAC offered tutoring in the Library, A – Building, and Residence Life. TOE offers Tutoring Online Every day through a relationship with Smarthinking (a Pearson service), which provides access any time of the day or night to online tutoring for GGC students. In the 2015-16 academic year, 522 unique students utilized 2390 tutoring sessions and/or submitted essays for review in multiple courses. 158 students used SmartThinking for assistance with more than one class. The AEC’s support of GGC’s students through the TIC-TAC-TOE programs has been recognized by a 2016 Chancellor’s Service Excellence Student Improvement Initiative Team Award—Silver level. In addition, AEC staff offer student success workshops and maintain a strong outreach presence on campus. The workshops cover topics as diverse as exam preparation and time management techniques, to stress relief strategies and how to use learning style preferences to improve study methods. For AY15-16, 78 workshops were offered and 581 students attended. The AEC regularly participates in campus-wide events for prospective and current students such as Bear Essentials orientation showcases, Path to Success Day, Grizzly Days, Open Houses, and even the Sustainability Fair. The AEC maintains social media presence with a Facebook page and Twitter account. These efforts are worth mentioning because they are invitations to students where they are—physically or virtually—and reinforce the idea that GGC is committed to supporting the whole student, academically and otherwise. More students are likely to access the AEC’s varied offerings when they are encouraged to do so by multiple parties and in different ways across campus and online. To these ends, AEC staff additionally visit classrooms upon request to discuss AEC services and events. Increased use of tutoring services in the Academic Enhancement Center (AEC) serves as a strong indicator of progress in the area of expansive and available tutorial support services. During the 2013-14 academic year, there were 15,357 tutoring sessions provided to 3,876 students in the AEC. During the 2014-15 academic year, there were 18,123 sessions provided to almost 3,600 students (unduplicated count) in the AEC. This represented an 18% increase in the total number of sessions from the 2013-14 academic year, and the trend of increased sessions continued in the 2015-16 academic year, with sessions delivered to an unduplicated count of almost 3,500 students in the AEC. Increased Grade Point Averages (GPA) is a valuable measure of success for the implementation of expansive and available tutorial support services at GGC. It is not possible to provide a baseline figure for this strategy as GGC has always invested heavily in making tutoring available and accessible to all students. Further, since students often access multiple forms of available tutoring support, it is not feasible to conduct a fine-grained comparison across the various options. Rather, assessment of this strategy rests in maintaining a positive impact of tutoring services as shown in Table 8 which compares the GPA of first-year students who utilize the services and the overall population. The Academic Enhancement Center (AEC) will continue to encourage efforts toward expansive and available tutorial support services, using innovative methods and technology to provide an effective and engaging tutorial experience. The AEC exists to help students become more confident, efficient, and successful learners. AEC tutors (both professional and peer tutors) and volunteer faculty continue to work to establish friendly, welcoming interaction with students while challenging and equipping them to excel in their coursework and ultimately in their careers. Further outreach efforts to students will be made to encourage greater and broader use of the TOE offerings. Outreach to multiple disciplines and all year-levels of students will continue. To accommodate student demands and better serve the GGC population, the AEC recently hired a new Coordinator for writing tutoring, as well as a Lead Tutor. These positions, in addition to the Math/Science tutoring Coordinator, provide middle-level leadership in the AEC, as well as professional development support for tutors. In Summer 2016, the AEC offices (2) moved to one central location. TAC support has been expanded across campus to include the residence halls, student center, library, and B-building atrium, all key traffic areas for students. By keeping the tutoring staff up to date and innovating in best practices for tutoring in their disciplines, as well as increasing outreach to students and providing them with a welcoming, professional learning environment, the AEC will continually expand its service excellence. GGC has also invested heavily in developing and deploying models of integrated learning that promote student engagement, strong academics, and development of relationships among students. GGC was a leader within the USG in building a strong program of concurrent remediation. In addition, GGC has established a sound mechanism for enrolling first-time freshmen into block schedules in which a single student cohort takes a set of classes together and will be piloting integration of these blocked courses into learning communities in Fall 2017. Each of these investments in integrated learning has shown clear benefits for students, and the combined impact is likely to be particularly beneficial for our specific student population. Block schedules serve to enroll and focus entering students in an optimal set of courses for first semester based on the student’s academic status (Learning Support or Non-Learning Support) and intended major or meta-major (STEM or non-STEM). Second, this strategy addresses the goals by promoting strong relationships between students in that it creates a cohort of students who are enrolled in a common set of classes, which facilitates the formation of social bonds and study groups. Thus, enrolling entering students into block schedules is expected to impact positively both first-semester academic success and first-semester retention. Since these factors are known to impact first-year retention and overall progression, this strategy is seen as essential to establishing a solid base from which to increase the number of students who persist in college and complete their degrees. GGC has continued to invest heavily in developing and offering remediation through a concurrent delivery model to qualified students. Developed by faculty, the model is based on successful models such as the Accelerated Learning Program used by Baltimore Community College. The College has successfully implemented programs for English (Segue English) and mathematics (ACCESS Math), pairing co-requisite remedial support and instruction with the appropriate college-level class. Starting the 2014-15 academic year, GGC offered courses pairing remedial support in reading and writing with ENGL 1101, thus making concurrent remediation available to an expanded population of students. While recent changes in USG policy regarding remediation combine foundation-level reading remediation with English, the investment in planning and curriculum development has proven useful in improving the framework for future concurrent remediation in English. Effective, well-designed concurrent remediation options are expected to lead to increased academic success and confidence and increased retention in academically underprepared students. GGC also has invested significantly in designing and using block scheduling as a strategy. GGC began offering block schedules to incoming full-time first-time students on a voluntary basis in Fall 2012 with 40 course blocks available. With preliminary data showing a positive impact on academic performance and retention, the College again offered 40 course blocks to incoming students on a voluntary basis in Fall 2013. In these two semesters, students were informed of the option to select a course block at the time of registration and were given a list of available choices. Students self-selected a course block and were enrolled in those courses by the Registrar’s office staff. Data from Fall 2012 again showed a strong positive impact of block enrollment. Because early data from the College’s pilot efforts with block scheduling indicated that this strategy supports success for the GGC student population, the College expanded its efforts in Fall 2014 and enrolled all first-time, full-time students with less than 12 hours of prior college credit in block schedules. This expansion was successful, and GGC is continuing this investment. During the 2015-16 academic year, specific activities have continued to focus on improving communication with students about their options and the rationale behind the course assignments. Further, the College has begun to develop a framework for more integrated planning and instruction across the courses to form strong learning communities. Progress for these efforts is measured by tracking the number of sections offered, which provides a measure of the number of students served. GGC has increased its investment in concurrent remediation each year, moving from 12 sections of Segue English and 8 of ACCESS Math in 2012-13 to 17 sections of Segue English and 18 sections of ACCESS Math in 2014-15. Further, during the 2014-15 academic year, GGC prepared to increase the scope of this initiative in compliance with new policies of the University System of Georgia. For Fall 2015, the College had 23 sections of Segue English, serving over 360 students. For learning support Math, the College offered 25 sections of concurrent remediation aligned with MATH 1001 (for non-STEM track students) and 32 sections aligned with MATH 1111 (for STEM track or Undecided students). Table 9 tracks the growth of co-requisite course offerings over the past two years. We expect growth in the upcoming year proportional to the overall growth of the student population. A second measure of progress for co-requisite remediation is the number of faculty in each discipline prepared to teach the courses. This number has increased over time as additional faculty are trained or hired with the appropriate skills and background to teach and engage with students in co-requisite courses effectively. An example of this effort is the specific training provided by faculty leaders in the English discipline for colleagues teaching the ENGL 0099 Segue courses. In the Math discipline, the effort is bolstered by the purposeful hiring of those with appropriate teaching experience and skills that will serve well in or be adaptable to the co-requisite classroom. Finally, the School of Transitional Studies is currently investigating creating a faculty professional development series on best practices in learning support pedagogy in conjunction with GGC’s Center for Teaching Excellence badging initiative. Basic activity and output measures are also used to track progress in implementation of block schedules and learning communities. As noted above, the College offered 40 course blocks in the Fall semester of 2012 and 2013 during its pilot implementation and test of this strategy. For the full implementation in Fall 2014, 122 course blocks were prepared based on 20 different possible configurations derived from meta-majors and learning support placement options, providing spaces for 2520 students in course blocks. For Fall 2015, there are 28 course configurations derived from the meta-majors and learning support placement options. This provides spaces for up to 2557 students. As of August 1st, 2207 students were enrolled in blocks. The critical measure of success for co-requisite remediation is the overall success of the students, both immediately in the Learning Support and college-level courses and in subsequent related classes. The results from the early implementation showed that students in the Segue English and ACCESS Math classes were able to exit Learning Support at higher rates than their peers in traditional Learning Support and passed ENGL 1101 and MATH 1111 at comparable rates to their non-Learning Support peers. Subsequent years have produced comparable results. For the 2015-16 academic year, the data continued to show that students in the Segue and ACCESS classes perform well. 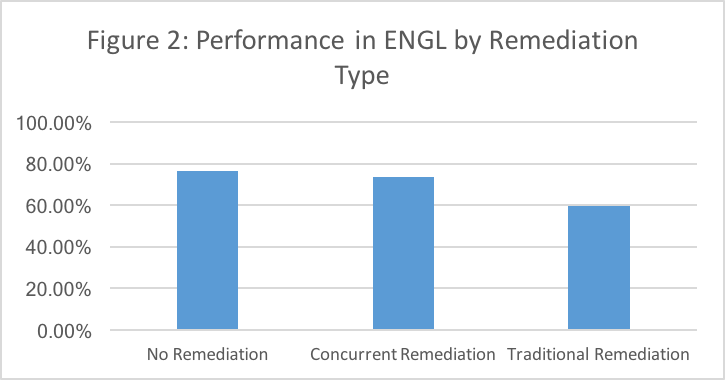 Figures 1 and 2 show that students in the concurrent remediation classes successfully completed ENGL 1101 and MATH 1001 at rates comparable to their peers who did not require remediation and substantially higher than their peers who completed a traditional sequence of remediation followed by the credit-bearing class. 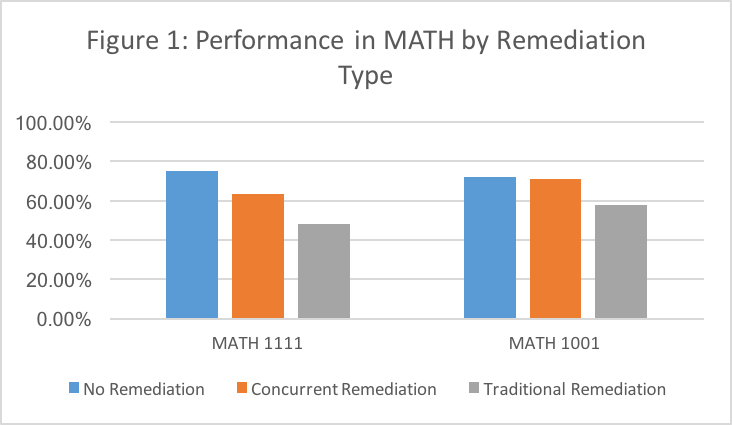 In MATH 1111, students in concurrent remediation successfully completed the class at a rate mid-way between their peers who did not require remediation and those who completed the traditional sequence. In the 2015-16 academic year, about 60% of students exited ENGL 1101 after having completed a traditional (non-concurrent, or foundational) remedial English class, whereas about 74% of students who enrolled in ENGL 1101 while in a concurrent co-requisite remedial ENGL 0099 section exited successfully. For MATH 1111, about 63% of students enrolled in concurrent co-requisite remediation successfully exited the Gateway course compared to 48% who had completed a traditional remedial course. For MATH 1001, the percentage passing for concurrent and traditional remediation were 71% and 58% respectively. These same data document high success rates in the learning support courses as successful completion of the credit-bearing class documents successful exit of the learning support requirement. As GGC increases enrollment in concurrent remediation, the target for success metrics is to maintain performance of students in concurrent remediation at the same level as performance of non-remedial students. As noted earlier, the block schedules are predicted to yield improvements in academic success and retention for enrolled students. It is difficult to identify specific baseline data for this strategy in part because GGC is implementing several overlapping strategies that impact the same students.However, for Fall 2012 and Fall 2013 students, some analysis is possible because not all incoming students were enrolled in blocks. A comparison of those in blocks to those not in blocks showed that the students in blocks had both higher GPAs and higher retention rates than students not in blocks. Data for the Fall 2014 student cohort are compared to the data for the Fall 2013 cohort and shown in Table 10. While the results suggest that a portion of the pilot results were related to self-selection of students into blocks, the ongoing data nevertheless show both a clear positive impact of the blocks on GPA and retention and, to some extent, a persistent impact on student success and retention. These data demonstrate that these are impactful strategies contributing to our overall success in maintaining strong early success and first-year retention rates in a high-need, under-prepared population. The primary challenge for GGC in implementation continues to be one of capacity building. While our data show that these efforts are successful and there is a need to grow the programs to serve more students, there are significant costs associated with hiring and preparing sufficient faculty to maintain implementation fidelity as these efforts scale up. As learning support continues to change throughout the University System of Georgia, GGC anticipates our programs will continue to grow and evolve in order to effectively meet the needs of our unique student population. The move toward increased numbers of co-requisite learning support offerings and more tailored options for STEM and non-STEM track students with respect to remedial mathematics should continue to enhance the opportunity for success among GGC’s less prepared first-year students. In the year ahead, careful measurement of student success rates will be taken. Similarly, the move toward integrating instruction across block schedule courses to create strong learning communities will strengthen these efforts. One additional area of development that will assist in the personal and academic development of our first-year students is the reinstatement and scaling-up of a robust first-year seminar, GGC 1000. This extended orientation model one credit course will help students successfully work through the academic and personal transitions attendant upon their enrollment in and progression through college. The FYS will build upon information and themes stressed in Bear Essentials orientation sessions, have students practice skills for academic and personal well-being, and give them a foundational understanding of major and career planning. While the first-to-second year retention rate for incoming first-year students at GGC currently approaches 70%, it is believed that reinstating a FYS (and other first-year experiences such as learning communities) will only improve this rate. More importantly, it will promote in students the skills and habits of mind that will strengthen their abilities both to understand college culture and successfully navigate any challenges they face in years 2-4; this thereby will help them more effectively progress to graduation. GGC is a champion of providing students the support and mentoring they need to be successful. The first-year seminar and other first-year programming efforts are integral to that mission. A pilot of GGC 1000 is planned for Spring 2017, with possible integration into learning community models to follow. GGC focuses on creating classroom experiences that are attentive and engaging, provide authentic experiences, and promote deep learning and transferrable skills. They address Georgia’s completion goals by fostering strong relationships between students, between faculty and students, and between students and potential future employers. These factors are known to contribute to student persistence and success and are expected to result in stronger than predicted academic performance, retention, progression, and graduation. A primary focus of GGC’s efforts in restructuring instructional delivery has been the development and delivery of active, engaging courses that include authentic discipline-based experiences. The flagship efforts of this initiative have been housed in the STEM disciplines and in Educator Preparation. The Nursing Program also invests heavily in active learning and authentic experiences in the field. Lastly, one critical feature of GGC's Honors Program is continual service learning and community service activities. Instruction based in active learning and authentic experience requires a skilled teacher and a well-designed curriculum. Affirming the College’s commitment to faculty professional development, GGC’s faculty have dedicated extensive time to professional development to acquire the skills in curriculum design and teaching needed to promote authentic experiential learning. This requires building and sustaining a network of relationships with local companies, schools, and medical facilities so that ample opportunities are available for student internships, placements, and other experiences. GGC's creation of a full-time Internship Manager position, reporting to the Provost and responsible for developing college-community partnerships and supporting faculty in overseeing student internship experiences, demonstrates GGC's continued commitment to providing valued, real-world, authentic learning experiences for its students. The STEM disciplines have been working collaboratively over several years to redesign classes and laboratory exercises to involve students in authentic research every semester of undergraduate enrollment beginning with the laboratory component of class in the first STEM course and building toward an independent or directed research project prior to graduation. GGC's new STEM programs' peer supplemental instruction program (PSI) meets specific academic needs of GGC’s STEM students by aiming to: (1) provide peer-assisted study sessions for subjects that are traditionally considered difficult - BIOL 1107K and CHEM 1211K are introductory STEM courses that have DFW rates ranging from 30-40%; (2) equip students with active learning competencies specific to STEM education; and (3) strengthen students’ confidence in STEM learning. GGC’s Educator Preparation programs also have been designed to provide opportunities for students to engage in authentic classroom-based activity. Majors are placed in field settings each semester with the level of responsibility and complexity of expectations set at a developmentally appropriate level each term. This immersive experience, coupled with a curriculum designed to support meaning-making to apply lessons learned from classroom experiences, provides GGC students with an enriching curriculum for preparing them for a future as classroom teachers. GGC’s Nursing program has implemented a similar immersive design, placing students in clinical settings beginning in their first semester in the major. The Nursing program uses a flipped instructional model for all courses, making extensive use of state-of-the-art simulation classrooms to engage students in additional experiential learning. Faculty of the Schools of Business and Liberal Arts engage in continual professional development in course design and pedagogy to create engaging courses and promote deep learning and development in their students. The Liberal Arts programs, like their STEM counterparts, encourage students to participate in internship programs through their curriculum. Faculty participating in these or their own authentic and service learning initiatives can receive support and training from GGC’s Center for Teaching Excellence (CTE). One innovation in professional development is the CTE Scholars Program, a digital badging initiative that tracks and promotes active learning pedagogies. For AY 2015-2016, the CTE held 27 workshops in the active learning track. For each workshop completed, a faculty member earned a micro-badge; if a faculty member earned all of the micro-badges necessary to complete the active learning track (5 altogether), then s/he earned a milestone badge. For 2015-2016, 184 micro-badges and 22 milestone badges were earned in active learning. For 2016-2017, CTE staff have developed an experiential learning badging track, designed to promote more specific pedagogies around service-learning and community engagement. CTE also provides training in intercultural awareness and competence through the college’s Quality Enhancement Plan (QEP) focused on internationalization of the curriculum. GGC’s QEP has several components, including a certificate in Global Studies, the enhancement of courses by way of adding internationalized content, a growing number of study abroad opportunities, and extensive faculty training on tuning instruction to the complexities of an ethnically, racially, and linguistically diverse student community. The core of that training is a multiday workshop on intercultural competency, whereby faculty develop the skills and sensitivity to engage students from a variety of cultural frameworks and perspectives while being conscientious of their own cultural assumptions about themselves and others. This training assists faculty in better engaging GGC’s diverse student body and especially students often categorized as “at risk,” given the significant overlap of GGC’s ethnically-diverse student community and the number of students eligible for Pell Grants. Progress for this initiative is measured by tracking the extent to which the faculty act to build their pedagogical expertise and the extent to which the curriculum involves students in active and authentic learning experiences. During the 2015-16 academic year, over 130 of GGC’s 418 full-time faculty actively participated in workshops and extended education offerings of the Center for Teaching Excellence. This represents the commitment of over 25% of the faculty in one single academic year. GGC's STEM URE effort currently involves 38 separate courses and 272 class sections and, in the most recent academic year, directly impacted 3505 individual (unduplicated) students. Similarly, progress in the Educator Preparation programs is measured by monitoring the success of the program in placing its students in appropriate settings. Tables 11a and 11b show the breakdown of student placements for two last two academic years. The Nursing program was also successful in placing students in appropriate clinical settings with all 31 of the first cohort placed during Fall 2014 and a total of 56 placed in Spring 2015 of whom 29 were continuing students and 27 were members of the second student cohort. Table 12 shows the number of Nursing students over the last two academic years placed in clinical settings as part of their instructional experience. The data for STEM, Business, and Liberal Arts students seeking internships is also encouraging. Table 13 shows the number of students enrolled in internship classes or who were in an internship experience in each discipline between Summer 2014 and Spring 2016. Critical measures of success for this initiative, aside from the broad College-wide measures of retention and progression, are measures that reflect the effectiveness of engagement and deep learning on student behavior and measures that reflect post-graduation success. Within the STEM majors, GGC has seen steady growth in the number of students engaged in undergraduate research, with 82 students enrolled in the senior research class during the past academic year, 8 students in the inaugural sophomore-level research class and over 40 students presenting at regional or national conferences. The intentional clinical placements for nursing students provide employment opportunities during their educational experience and post-graduation as registered nurses. May 2016 nursing graduates had 100% employment post-graduation. The Educator Preparation programs have seen students successfully complete the program prepared for the demands of their careers can be seen in the fact that approximately 10% of the new teachers hired by the Gwinnett County Public Schools over the last two years were GGC graduates, and approximately 65% of graduates are hired by Gwinnett County Public Schools. A broader measure of success for this metric, as for others, is the overall success of GGC students in their academic careers and the degree to which students report being deeply engaged in their courses and with their faculty. Tables 14 and 15 below show the College’s baseline data for AY13 and the related figures for each year since. 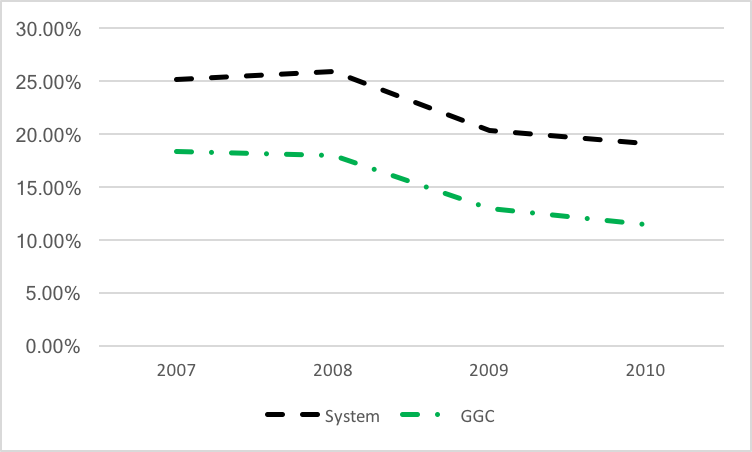 As can be seen, GGC is achieving strong retention and graduation rates relative to peer institutions and expects to see these rates continue to improve. These results, while indirect, provide strong evidence that GGC’s commitment to active pedagogy is creating an engaging, challenging, and supporting environment for students. GGC’s long term goals for retention and progression are shown in Table 14. The data related to these specific efforts continue to be highly encouraging. GGC is succeeding in engaging, retaining, and graduating a high-risk, high-need population of students. Both the quantitative data reported here and the anecdotal data available indicate that the GGC educational experience, which is highly relational, active, and authentic, is providing the environment and context necessary to support student success and development. Going forward, the College will maintain its commitment to strong pedagogy both through its hiring processes and through its investment in professional development for faculty to enable them to design and deliver GGC’s highly effective Integrated Educational Experience. GGC offers a high-quality, accessible, and attentive education for less money than most other schools in the USG. 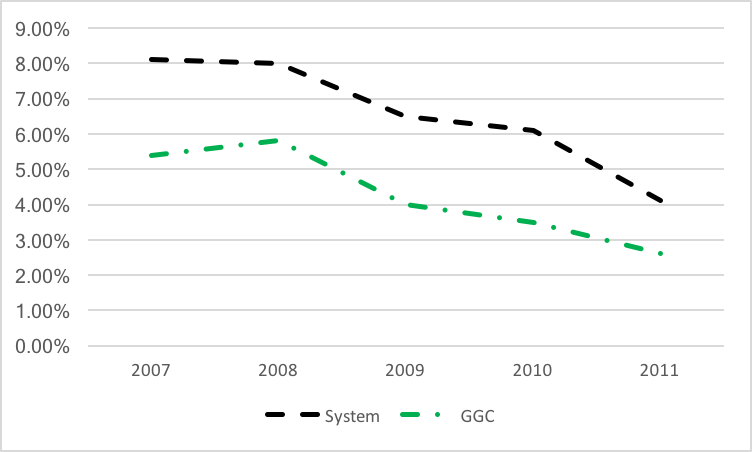 GGC controls costs through a variety of measures aimed at not sacrificing the quality of education but assessing which services are essential to the College’s core mission and which to outsource for savings. Thus, support services such as grounds and facilities maintenance and food services are outsourced for a lower costs. In addition, GGC maintains a relatively flat organizational structure and a commitment to lean staffing to maximize fiscal flexibility and investment in the mission, vision, and core competencies. Data on the core metrics GGC has elected to track are encouraging for this reporting year as shown in Table 14 below. The College met its targets for most metrics in Academic Year 2015-16. Notably, since hitting a low of 61.5% for the Fall 2010 cohort, first-year retention has improved steadily, indicating that GGC’s integrated efforts to ensure access, attentiveness, and affordability are having an impact on student success and persistence. Since early success, which is known to predict progress and persistence, is a primary focus of much of GGC’s innovative educational model, GGC will continue to monitor this closely. Early data on graduation numbers are also encouraging, as can be seen in Table 15. While the proportional graduation rate has continued to decline slightly, which would be consistent with earlier lower retention rates, the number of students graduating in each cohort has continued to climb, reflecting GGC’s rapid growth rate. As reflected in Figures 3, 4, and 5, the slight declines in the College's graduation rates also mirror declines in system-wide graduation rates over that same time. Yet despite that, the difference between the system's 4- and 6-year graduation rates and the College's 4- and 6-year graduation rates nonetheless has shrunk. The data on first generation and Pell Grant eligible students continue to show that GGC is maintaining its strong focus on providing access to underserved student populations. 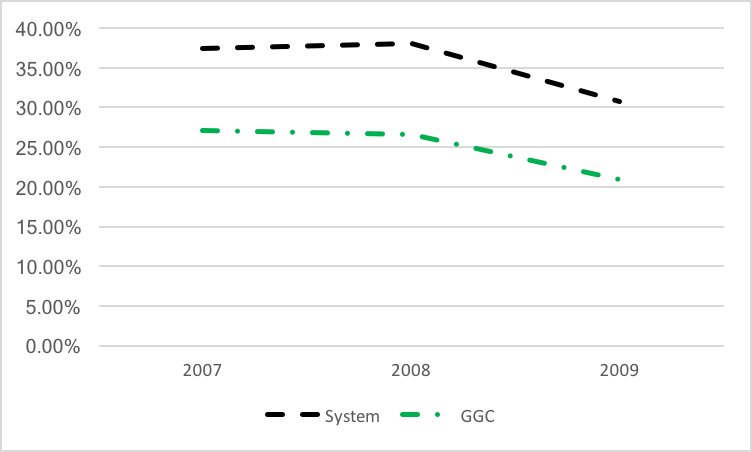 The continuing improvements in first semester exit rates for Learning Support students, and particularly the rates for students in the concurrent remediation classes (Segue English and ACCESS Math), provide evidence that GGC’s efforts to strengthen and transform remediation are having the intended effects. As GGC implements the proposed new models for remediation, we expect to see differential exit rates in foundations-level and co-requisite Learning Support courses. Table 14 shows projected exit rates for each course level. The common theme across the specific elements of GGC’s attentive learning model is that they are all high engagement, individual focused efforts. The level of impact of these efforts is perhaps not surprising given the high-need population that GGC serves. GGC’s commitment to meeting students where they are and providing the kind of high impact scaffolds and supports that are known to engender success is continuing to bear fruit as can be seen in the performance metrics in Tables 14 and 15. Efforts that are focused on wide-scale communication and technology have shown less impact and less penetration into the mindset and practice of the institution. Two primary factors have contributed to the challenges in implementing strategies based on technology tools and communication. The first is the necessity of prioritizing initiatives in the context of budgetary limitations presented by the current economic climate. Faced with choices between funding direct student intervention efforts and funding other initiatives, GGC has consistently chosen to prioritize the former, to good effect. Thus, investment in early alert technology and implementation of some capabilities of DegreeWorks have been delayed. GGC expects to increase efforts on these initiatives as its funding improves.